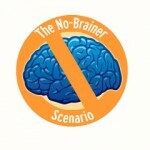 I actually DID use the No-Brainer Scenario on a holiday dilemma this season! Honestly, Victoria, I use it all the time, it’s become one of those go-to tools for me. I can’t thank you enough for inventing it!